Today we attended the Magnolia neighborhood farmers market for the first time ever. For the last three years, we have been vending at the same three markets each week, and got to know each neighborhood’s general preferences (the Central District likes kale all year ’round, Queen Anne loves lettuce), and the regular shoppers. The regular shoppers have also gotten to know us, as well as the many weird and unfamiliar vegetables that we grow. For the first season or so, we worked hard to introduce people to some of our unusual crops, such as purslane, radicchio, and spigariello. 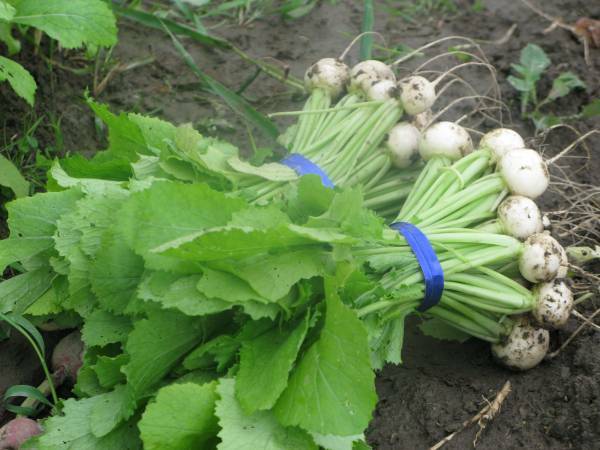 We also grow some uncommon varieties of common vegetables, like Shunkyo radishes, and Speckled Amish butter lettuce. Jason and I sometimes joke that we’ve given out our standard recipe for baby white turnips hundreds of times – but we’ve also made scores of people into devotees of the turnip – people who are sad when they come to the market and we don’t have turnips. Now that we’ve been at the same markets for a few years, we spend a lot less time at each market explaining what things are and how to cook them. However, starting out at a new market today reminded me that there are still lots of people in Seattle who don’t know about purslane, Shunkyo radishes, and bronze romaine lettuce. It’s fun to sell someone a vegetable they have never tried before, or maybe never even heard of. One of the most rewarding farmers market experiences is when a customer comes back the next week and says “I did what you told me, and roasted the sprouting broccoli, and it was so good! What should I make this week?” I love to think that we’re helping people become more adventurous and confident cooks, and that we’re helping make some under-appreciated and delicious vegetables more well-known. On the other hand, it’s sort of tough to stand at the market and answer questions and give advice for four hours and not actually sell very many vegetables. That’s what today was like. But, we’ve done this before, and have more to share than when we were first starting out. I was glad to see so many people stop and ask about our produce, and I expect some of them will be back to buy more next week. No matter how beautiful our rainbow chard or radicchio looks, people, having bought it, have to take it home and decide what (if anything) to do with it. 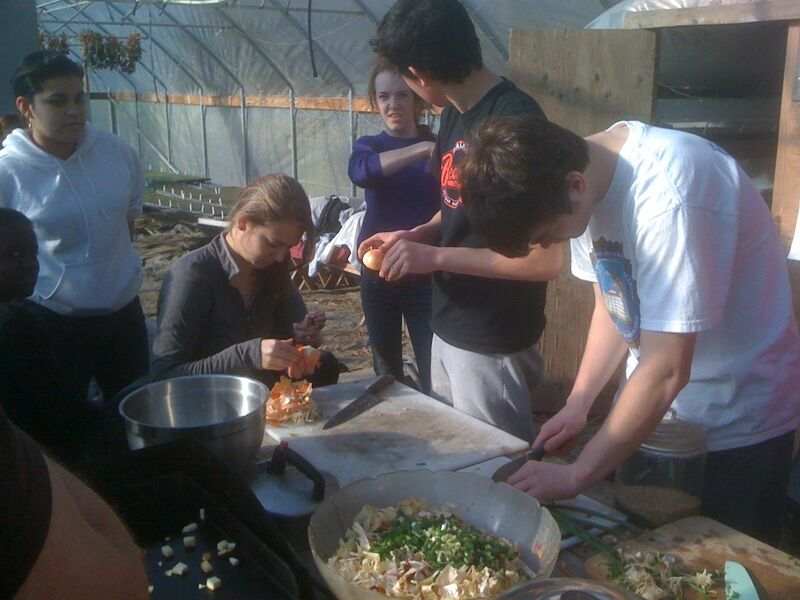 Home cooking is the final frontier of the movement to re-localize the food economy and change America’s eating habits. 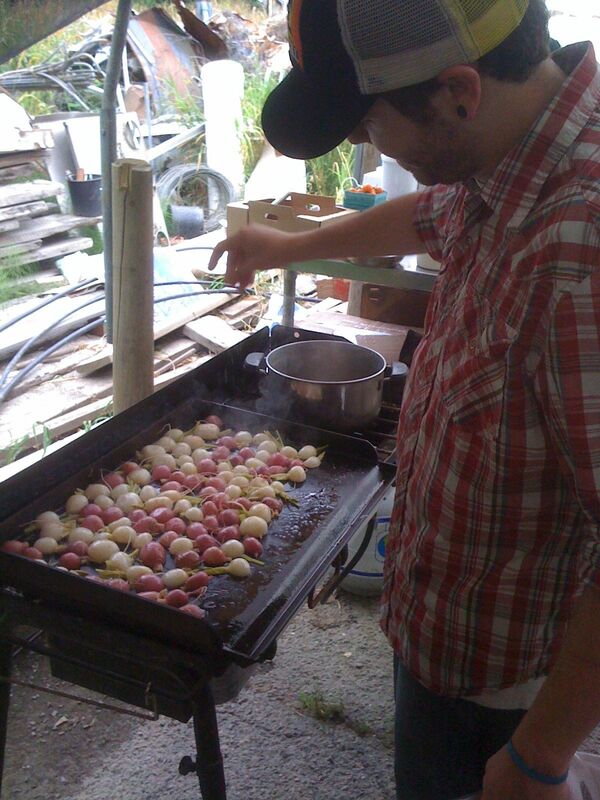 Jason and I have a slew of simple recipes – actually, more like preparation guidelines – for almost everything we grow. Grilled romaine lettuce, braised radishes with radish greens, butter-steamed pea vines, roasted broccoli (or roasted anything), radicchio salad with caramelized onion, beet “ceviche”. We want to send people home with the ability to take the vegetable they bought and two or three other staple ingredients, and cook something delicious in just a few steps. I love the cooking demonstrations at the farmers market (especially when we get free samples), but they often require a bunch of other specialty ingredients, measured quantities, and a printed recipe with all the instructions. We have a Recipes page on this blog where we have started to collect some of our standby market cooking ideas. Check it out – and we’d love to hear some of your easy peas-y vegetable recipes. A customer at the Magnolia farmers market asked me what to look for in choosing good radishes. I explained how radishes can to change from just perfect to stringy and inedible in only a few days, because they bolt (make a flowering stalk) very quickly in summer weather. I showed her how our Shunkyo radishes still were forming tiny new leaves at the crown of the radish root, and that a bad radish will have a tough stalk there instead. She had lots of questions about how to choose the best produce at a market, and wondered where I had learned everything… I told her I spend a lot of time with vegetables. However, I do have an excellent vegetable reference guide to recommend, Elizabeth Schneider’s “Vegetables from Amaranth to Zucchini.” It’s a beautiful, extensive, and well-illustrated guide to most of the vegetables you will find at farmers markets in the US. It has several shortcomings: it’s expensive, it excludes some quotidian vegetables such as tomatoes, and, I think most importantly, it’s based on the experience of an East coast market-goer, so some of the information she provides doesn’t necessarily hold true for our area. Nonetheless, I recommend seeking it out at a bookstore or library. If nothing else, the photographs of vegetables are worth an extensive perusal. Let’s all cook and eat more vegetables! 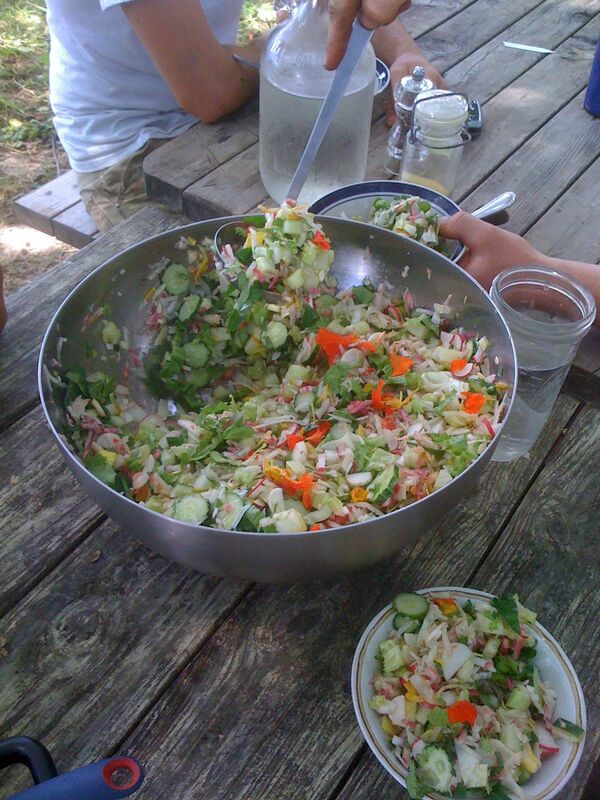 Summer veggie salad looks fabulous.